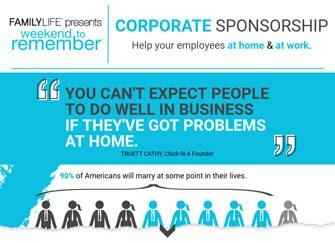 The health of marriages in the workplace can have a positive or negative impact upon businesses and organizations. That’s why we created the Weekend to Remember® Corporate Sponsorship, to help organizations make a difference in marriages. Investing in employee marriages and families leads to a happier, healthier and more productive team. How does the Corporate Sponsorship work? Weekend to Remember Corporate Sponsorships provide a convenient way for business owners or influencers to invest in employees by covering the cost of their registration to attend the Weekend to Remember® getaway. To help you promote the Corporate Sponsorship Program within your business, we have developed special materials for your use―Weekend to Remember brochures, inserts, posters―as well as links to promotional videos. For more information and Corporate Pricing, please email your FamilyLife Advisor at corporate@familylife.com or call 877-352-2543 to get started! It’s a getaway weekend designed for couples to develop and strengthen their marriage, no matter how strong or fragile. During the Weekend to Remember, couples receive practical, biblical help to take home and apply to their relationship. Help your employees at home and at work.